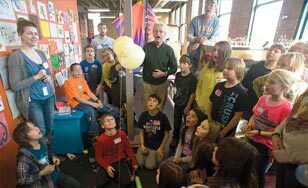 With support from the NASA space agency, Beth LaVigne, an assistant professor in the College's School of Education, joined forces with the Duluth Children's Museum to get Duluth schoolchildren more interested in science. Last November she and some of her education students led hands-on activities for fifth-graders from Stowe Elementary School. They facilitated groups of the Stowe students carrying out a "heavy lifting" challenge involving a simulation in which students design a means to carry a "payload" of paper clips to a height of three meters. The simulation mirrored NASA's efforts to efficiently deliver people and objects to destinations in space. St. Scholastica and the Duluth Children's Museum received a mini-grant from NASA designed to engage a wide variety of educational partners — such as museums, schools or school districts, and youth organizations — to infuse STEM (Science, Technology, Engineering, and Math) content in existing student programs. The objectives are to build the capacity of community- and school-based organizations to engage underserved and underrepresented students in high-quality STEM content in extended learning experiences tailored to meet local needs, and to support the infusion of NASA themes and resources. The students used NASA curriculum materials aligned to grade level standards in science and math.